I managed to experience the flavours of four ethnic events last Saturday in the space of nine hours including transportation. They were all different, but very rich and rewarding. The first was the Jerkfest in Mississauga. Arriving when the festival opened at 11am, I found parking easily. A no-nonsense guard at the gate searched backpacks in front of a sign that read “No Drugs” and, if I remember correctly, “No Firearms.” This was a reassuring precaution considering the shooting after the Caribbean Festival Parade the week before. Everything else was pleasant. Not everything was ready and performances didn’t look like they were starting soon. There were no queues for the rides or inflatables. 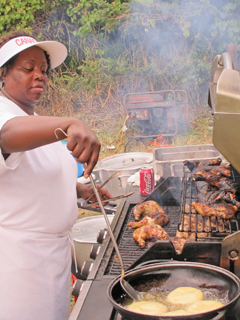 The jerk chicken, curried goat, and rotis were cooked or just about to be cooked in a dozen food tents. A poutinerie was open. The advertised VIP lounge was set up with tables and chairs but it was empty. The vendors were ready. They were an interesting mixture of Jamaican, Chinese, and Tibetan. Everyone agreed to let me take pictures. They both barbecued year round in Toronto. One had a special coat for barbecuing in the winter. I’ve never heard of anyone barbecuing in the cold here. “A lot of people do it,” the Jamaican woman said. “It gives you a feeling of summer all year round.” It seems, Jamaicans have brought us a new tradition. I bought some jerk chicken, and later ate it for dinner. It was delicious. The base of Centennial Park’s ski hill was such a pretty setting, I would like to go back later in the afternoon, next year. I took the subway to the Taste of the Danforth and arrived about 1pm. By that time, people were pouring into the Danforth. Line-ups had already started at what looked like the most popular food stalls: deep-fried calamari and pierogies. I opted for deep-fried scallops, sweet-potato fries, and roasted pineapple – all yummy. People were sitting in restaurants and on the sidewalks when not strolling. They were trying out the golf and basketball hoops. I found a section of mechanical rides and inflatables, and a train-ride for kiddies. No climbing wall this year. And no one was giving free hugs. Three stages of performers were going strong. 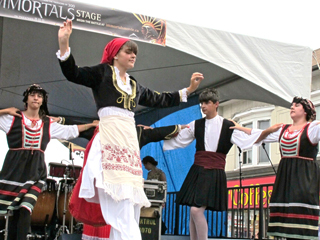 A group of dancers from Crete in traditional costume — the men in skirts – were at the stage at the eastern end. Then came a Greek sword fighting story with actors in ancient armour. It was an elaborate advertisement for the movie “The Immortals” due out in November this year. There was nowhere to sit to watch. The police, Western Union and BMO had booths. The Toronto zoo had a collection of animal pelts you could examine. I was attracted to the sound of classical music instruments. I found a quartet from the Toronto Symphony Orchestra playing nearby – the theme from Indiana Jones. If there had been somewhere to sit besides the sidewalk, I would have stayed. A nearby restaurant had chairs but they were all full. As I left, a pair of buskers were playing a harp and a violin outside the Chester subway station. They were good, too, but I needed a chair. In a way, I was glad to get away from the crowds. 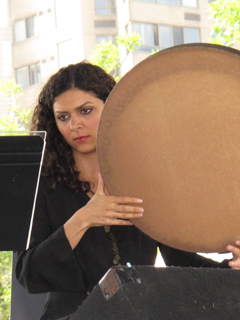 In contrast, the Sufi Devotional Love Songs at Harbourfront were sparsely attended. We sat on fake grass by its Redpath Theatre. It was softer than concrete. And what a contrast this was to Taste on the Danforth! The singing of the four women was magnificent. The drumming was intricate and amazing. The audience cheered. I have now added Doula to my list of performers if I ever have to organize a show of Toronto’s multicultural talent. I stayed for the first 30 minutes of the Hiroshima Day event. Outside the Church of the Holy Trinity we were greeted by anti-nuclear signs and two women folding origami paper cranes. My husband said Hiroshima was not a cultural tradition and should not be included in this blog. I argued that it is now part of Japanese tradition. What do you think? 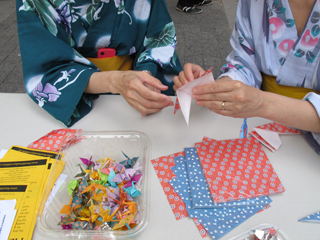 Folding 1000 paper cranes now symbolizes wishes for peace in Japan. It started with a young girl who tried to fold 1000 of them before her death. She was dieing from leukemia following radiation from the Hiroshima atomic bomb. There were at least 1000 paper cranes decorating the altar at the church. Within this context and the recent events at the Fukushima Daiichi Nuclear Power Plant, the drums and the eery wail of the conches at the church were especially powerful. I almost wept during the performance of the Yakubo Traditional Japanese Drummers. The event, which filled the church, was organized by a coalition of Japanese, peace, interfaith, and anti-nuclear organizations.